In 1907 came the first of four separate productions of 'The Gondoliers', again at the Town Hall. The Thespians, with regular and popular principals, were now well launched and had won the support and approval of the public. 'The Mikado' was successfully produced in 1908, as was 'H.M.S. Pinafore' in the following year. 1910 was something of a special year for, in-the spring, two complimentary performances were given for the benefit of the conductor, William Wurr, the first at Stevenage Town Hall on April 13th and the second at Hitchin Town Hall on the following evening. The show chosen was Trial by Jury' , preceded by two short plays, 'That Brute Simmons' and Woman's Wrongs'. Great amusement was caused by members of the jury, who were made up to represent prominent Hitchin citizens. 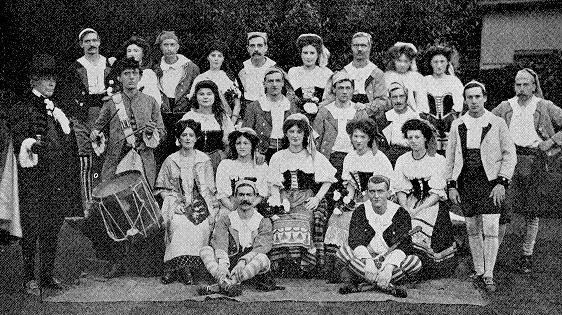 In the autumn of the same year came the Society's most adventurous undertaking to date the production of 'Ruddigore'. This Gilbert & Sullivan opera had never been performed by the D'Oyly Carte Company since the original production in 1887 and had been attempted by very few amateur societies. SIR, As one of the newer residents in Letchworth I have just returned from Hitchin's new Town Hall and the local Thespians' performance of 'Ruddigore'. The brief but courteous request of the management to ladies to remove their hats was, I believe, well observed. But a female who sat two seats in front of me towards the rear of the two-shilling seats regarded the description as inapplicable to herself. During the whole of the performance she retained a large turban hat of black beaver, with a bow of black ribbon at the left side, and pierced with jet pins. I trust she will recognise this accurate description (supplied by my wife), though I do not expect women of her class to regret that she almost completely shut out the stage from my view. The 'afternoon tea business' refers to the provision of teas and refreshments between the acts at Wednesday matinees, a practice which certainly continued for some years.